Two Thumbs up for the Summer Salad! Summer is almost there and as the weather gets hotter, it’s going to take lot more effort to stay hydrated especially when you are spending long day outdoors. For kids its vacation time and sports and continuous exposure to high temperature and humidity without any rest and fluids will lead to lack of energy, dizziness headache, weakness and sometimes severe cramps and fluid retention. For those who love cooking, the kitchen heat will melt them away causing dehydration and it’s no fun eating heavy and hot food. The only soultion is — Water your body! We need more raw and cooling foods to help nourish and hydrate our body cells during the summers. The metabolization of raw food requires more energy in order to keep our body temperature cool. Apart from being chilled and high in water content these provide fiber for easy digestion thereby eliminating the toxins out of our body. Do you know there are hydrating foods that provide about 20 – 25 percent of our daily water intake and it is especially important to consume these during summers. Salads are the actual summer heroes, best to grab more fruit plates when out in the outdoors because they are packed with anti – oxidants protecting our body from free radical damage to cells and these are easy to get and carry too. Some of the top water containing fruits are watermelon, melon, tomatoes (containing lycopene phytonutrient that will help protect skin from ultraviolet rays), grape fruit, pears, blue berries, pineapple (the bromelain in it has many health benefits especially in reducing cough) and cucumber. Adding in leafy greens like spinach (Vitamin A and C) for liver detoxification with high watery lettuce, celery is brilliant. Carrot is high in water too with beta carotene phytonutrient making the salad plate more colorful. Fresh herbs like Parsley, mint, cilantro, coriander and basil are fabulous reducing headaches, toothaches, calming nerves and sore throats. Ensure you add spices like cinnamon, raw garlic and raw ginger which help in keeping the cholesterol levels under check and being anti-inflammatory these fight against high BP, cancer and diabetes. 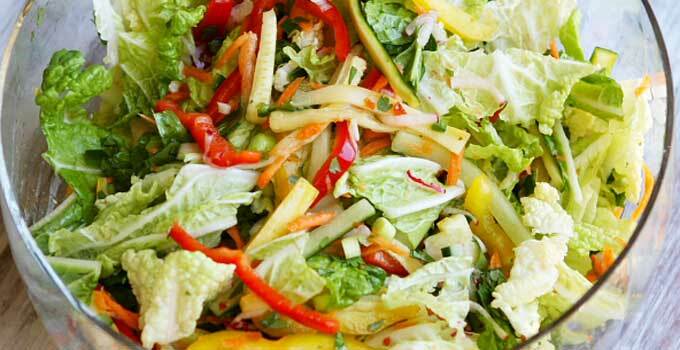 Pepper goes awesome with salad curbing acidity. Healthy fatty acids and proteins through nuts like almonds (vitamin E and fiber), walnuts and flaxseeds for omega boost. You may also add peanuts, cashews, pistas and seeds like sesame, sunflower, chia(topmost hydrator) for variations. Olive oil rich in MUFA (Mono Unsaturated Fatty Acids.) can be added to salad(The best form is the cold pressed virgin oil good for thyroid which also has phytonutrients. Canola,walnuts,avocado and walnut oil are wise picks for salad dressing too. Do not forget to sprinkle lime to keep it alkaline, remember acidic environmentprovides room for diseases. We need to go lighter on the meals avoiding meat, egg and dairy products especially. *Fruits mentioned above mixed with yogurt for breakfast and you get combination of carbs and proteins. *If you are going on a long day out, you can combine your oatmeal with fruits like apple, pear and blueberry. you may add some nuts. *Apple/high watery fruit salad mixed with cinnamon, raisins and sprouts. *Fresh fruits (carbs), vegetables (fiber), sprouts(proteins) through beans, lentils and sprouts. *Watermelon, tomato, onion, cheese mixed with salt, vinegar oil chilled with lettuce leaves with black pepper, you can add kale and cabbage the most calorie dense foods. *Watermelon, cucumber, bell pepper, spinach, avocado, lime, add quinoa. Apart from complete proteins this dish will also provide calcium and vitamins. *The best blend of salad for lunch/dinner would be vegetables, good carbs, lean proteins(beans, chicken, shrimp, tofu, cottage cheese) and healthy fats, adding in red onions will keep it anti – inflammatory and anti – oxidant rich. *Quinoa/beans/lentils/chicken with red bell pepper and veggies (Dinner). Sprinkle lime and add in herbs according to your taste, you may also add spices to make it interesting. The salads will not only provide water but will also keep you full for a longer period of time thus helping you to be in shape. You can use lots of creativity to make salads of your choice. You can design a different recipe every meal. I would say grab your salad bowl and create your fun, nutritious and delicious summer salad to reenergize yourself.